Chambray and white are the best denim on denim combinations around town. Don’t you think? SheInside Chambray Top, Dorothy Perkins White Jeans (similar), Old Navy Bucket Purse, Thrifted heels, Versona Accessories (similar), Citizen Eco Drive Watch (similar). Love chambray (I’m wearing it too today!). Great outfit and the bucket bag is super cute! This looks so good on you! I love the bag and that statement necklace. Perfect denim look. I might have to get that bag after seeing how you styled it. 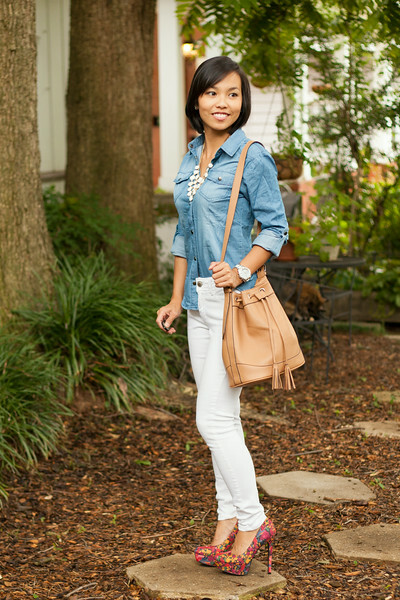 You could never go wrong with Chambray on white. Love your pumps also. Fabulous! Loving how classic and chic this look is! You look fantastic! What a great classy & chic look and those shoes…wow! WOW! I love this look. Adding these adorable heels was the icing on the cake!